City of Peterborough Swimming Club (COPS) star Jaxon Simmons has had double cause for celebration this week. The 17 year-old Arthur Mellows Village College student has enjoyed British Championship success and earned a GB call-up. Jaxon Simmons has been competing against the best of the world’s para swimmers at the British Para Swimming International meet 2017 (BPSI) at Ponds Forge in Sheffield. Earlier this year Jaxon was selected to join the British Para Swimming Podium potential programme designed to support athletes to achieve their goal of competing at the 2020 and 2024 Paralympics. This year the World Para Swimming organisation has introduced a World Series where competitors will compete at five International meets to determine who is the best performing para swimmer in the world. Prior to the Sheffield meet Jaxon had been selected to represent Great Britain at the Berlin World Series event to be held in July. The British Para Swimming International Meet 2017 was also the third leg in the World Series and competitors had three opportunities to qualify for finals. The 10 highest scoring competitors in each event went through to the World Series 1 final, the next 10 went through to the World Series 2 final and the next 10 highest British competitors went through to the British final. Each event in para swimming is divided into three classifications according to the type of disability that the swimmer has. Each para swimmer is awarded disability points based upon how close their time is to the world record for that event. In the British Para Swimming Championships each race is swum as a multi classification (MC) event meaning there are swimmers in different classifications competing in the same race. Jaxon swims in the S13 category for sight impaired swimmers. 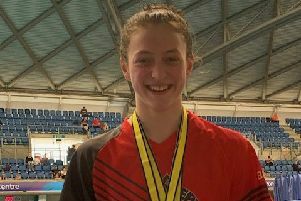 Over the four-day competition, Jaxon competed in six events, setting three new personal best (PB) times and qualified for one World Final and four British Finals. On day one Jaxon competed in the MC 100m freestyle in which his time of 60 seconds was a PB that put him through to the British final in seventh place. Jaxon’s time in the final was slightly slower but he did improve his placing to sixth. Jaxon went on to compete in the MC 100m breaststroke where he again set a PB of 1:20.41 to qualify for the British Final in 10th place which was also his final placing. On day two Jaxon again had two events starting with the MC 50m freestyle where he again set a PB in the heats to qualify for the British final in seventh place. Jaxon went on to improve his PB to 27.41 seconds and finish in sixth place. In the MC 200m individual medley Jaxon again set a new PB in the heats of 2:33.42 but did not qualify for the evening finals. On day three Jaxon competed in the heats of the MC 100m butterfly event in which he set a three-second PB to qualify in 10th place for the British final. Jaxon didn’t improve on his qualification placing in the final but he did set another PB in the final of 1:06.63. On the final day Jaxon competed in the 400m freestyle event and his time of 4:33.33 saw him qualify for the World Series 1 final. His time in the final was slower than the heats but he finished in 14th place overall.